The demand among scientists and clinicians for targeted quantitation experiments has experienced explosive growth in recent years. While there are a few books dedicated to bioanalysis and biomarkers in general, until now there were none devoted exclusively to addressing critical issues surrounding this area of intense research. 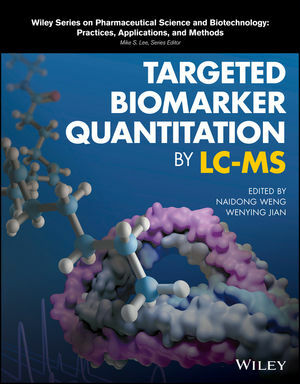 Target Biomarker Quantitation by LC-MS provides a detailed blueprint for quantifying biomarkers in biological systems. It uses numerous real-world cases to exemplify key concepts, all of which were carefully selected and presented so as to allow the concepts they embody to be easily expanded to future applications, including new biomarker development. Target Biomarker Quantitation by LC-MS primarily focuses on the assay establishment for biomarker quantitation—a critical issue rarely treated in depth. It offers comprehensive coverage of three core areas of biomarker assay establishment: the relationship between the measured biomarkers and their intended usage; contemporary regulatory requirements for biomarker assays (a thorough understanding of which is essential to producing a successful and defendable submission); and the technical challenges of analyzing biomarkers produced inside a living organism or cell. Target Biomarker Quantitation by LC-MS is a valuable resource for bioanalytical scientists, drug metabolism and pharmacokinetics scientists, clinical scientists, analytical chemists, and others for whom biomarker quantitation is an important tool of the trade. It also functions as an excellent text for graduate courses in pharmaceutical, biochemistry and chemistry. Naidong Weng, PhD, is Scientific Director, Janssen Fellow, and Head of Bioanalytical Chemistry and Pharmacokinetics within Department of Pharmacokinetics, Dynamics and Metabolism at US East Coast, Janssen Research & Development, Johnson and Johnson. He has over 25 years of experiences on quantitative bioanalysis. His research interest includes using HILIC-MS/MS for quantitation of highly polar analytes as well as chiral analysis. He has published more than 110 journal papers and book chapters. Wenying Jian, PhD, a Senior Principal Scientist of Bioanalytical Chemistry and Pharmacokinetics within Department of Pharmacokinetics, Dynamics and Metabolism at US East Coast, Janssen Research & Development, Johnson and Johnson. Her research experience and interest center on application of advanced LC-MS methodologies in detection, identification, and quantitation of endogenous molecules, drugs and their metabolites, including small and large molecules, and in complicated biological matrices. She has published more than 40 journal papers and book chapters.